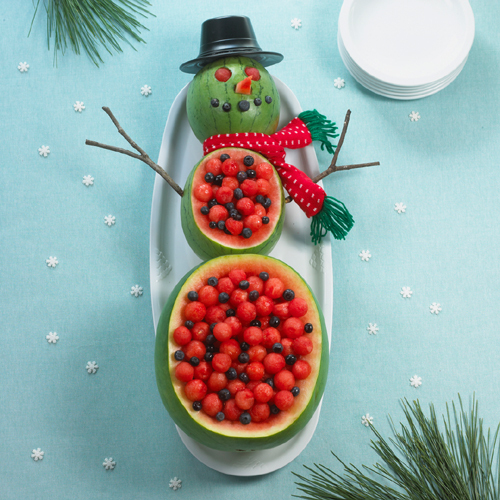 THE WATERMELON SNOWMAN - What About Watermelon? The National Watermelon Promotion Board website is chock full of cool watermelon resources and activities, but one of the best and most appropriate for this time of the year is their instructions for creating a watermelon snowman. Below is a photo and instructions, courtesy of the Board’s website, followed by a photo that demonstrates how to make the snowman. 1. Using one round seedless watermelon and two personal sized watermelons (one larger and one smaller), cut a ¼ inch slice off the bottom of each melon to provide a stable base. Use the smallest melon for the head, the next largest for the torso and the largest for the lower body. Set aside the smallest watermelon. 2. Cut the tops off of the large and medium watermelons, as shown, to create bowls. Scoop out flesh, using an ice cream scoop or large spoon. 3. Taking the smallest watermelon that has not yet been cut, scoop out eyes using a melon baller. Invert melon balls and reinsert. 4. Using a mini melon baller or a paring knife, scoop out holes for the nose and mouth. Carve a piece of watermelon into a triangle for the nose, and fill mouth holes with blueberries. 5. Connect all three watermelons on a platter, using large wooden skewers. 6. Insert y-shaped sticks into middle watermelon for arms. 7. Fill bottom sections with fruit salad of melon balls and blueberries. Decorate with scarf and hat. This Watermelon Snowman is so cool. Seems easy to make too. This is so cool for a Christmas in July get together. Easy and quick. Even the kids can help with this.